Our Mottto: Advertising effectiveness is about attracting customers. It's not the beauty of the advertisement only, but more importantly the message must attract the customer's attention. This requires not only a good idea, but also professional implementation process. And this is our domain. Have you noticed on TV, in magazines or on billboards how witty and so called creative ideas end up unsuccessful? With us it will not happen. Instead of manuals we use our 25 years of business experience and progressive ideas. Graphic studio MY TOUR is preparing high level promotional materials for our customers. 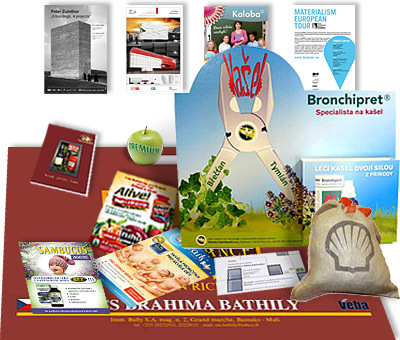 We also provide many other advertising related services. Take advantage of our many years of experience in the preparation and organization of advertising campaigns. Our portfolio can be viewed here. Contact us at studio@mytour.cz and find out what other services we can provide you with.